“Music Licensing Tips & Tricks for Film/TV” by Amy E. Mitchell. Published in the materials for the SXSW Conference, March 15, 2019. “Time-Saving Approach to Client Screening and Intake” by Amy E. Mitchell. 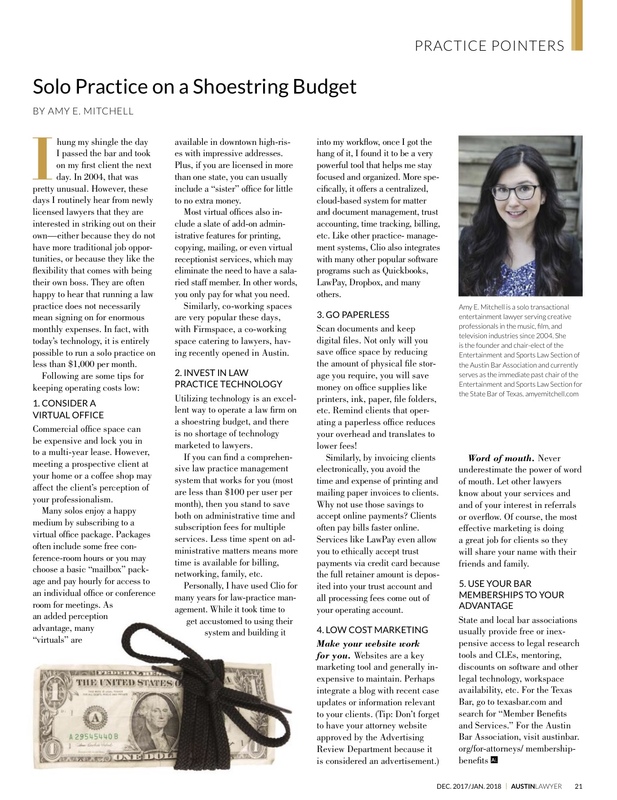 Published in Austin Lawyer magazine, July/August 2018. “Off-screen Behavior Matters: Morals Clauses for Performers” by Sally Helppie and Amy E. Mitchell. Published in the materials for the SXSW Conference, March 15, 2018. “Solo Practice on a Shoestring Budget” by Amy E. Mitchell. Published in Austin Lawyer magazine, December 2017/January 2018. “Alphabet Soup: An Overview of Key Entertainment Industry Players and Contract Negotiation Terminology” by Amy E. Mitchell. Published in the materials for the Entertainment Law Institute Bootcamp, November 15, 2017. 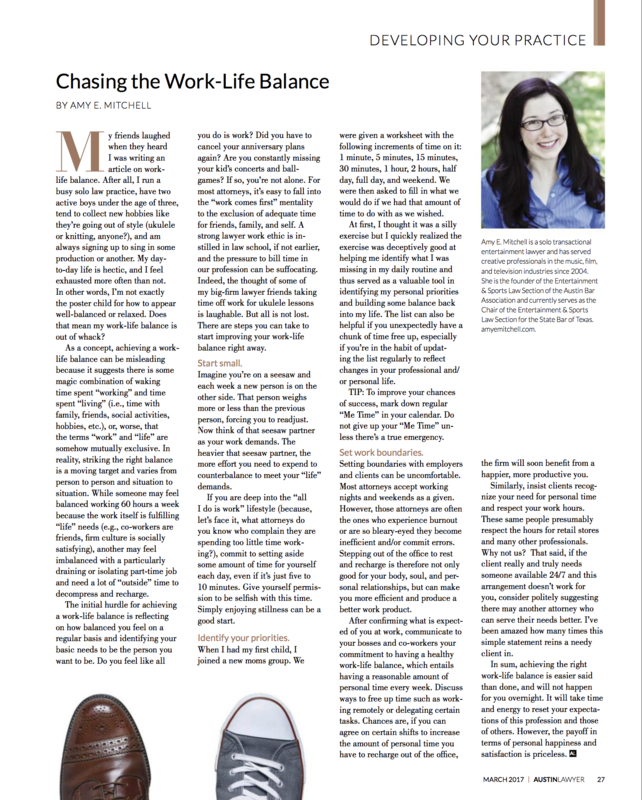 “Chasing the Work-Life Balance” by Amy E. Mitchell. Published in Austin Lawyer magazine, March 2017. 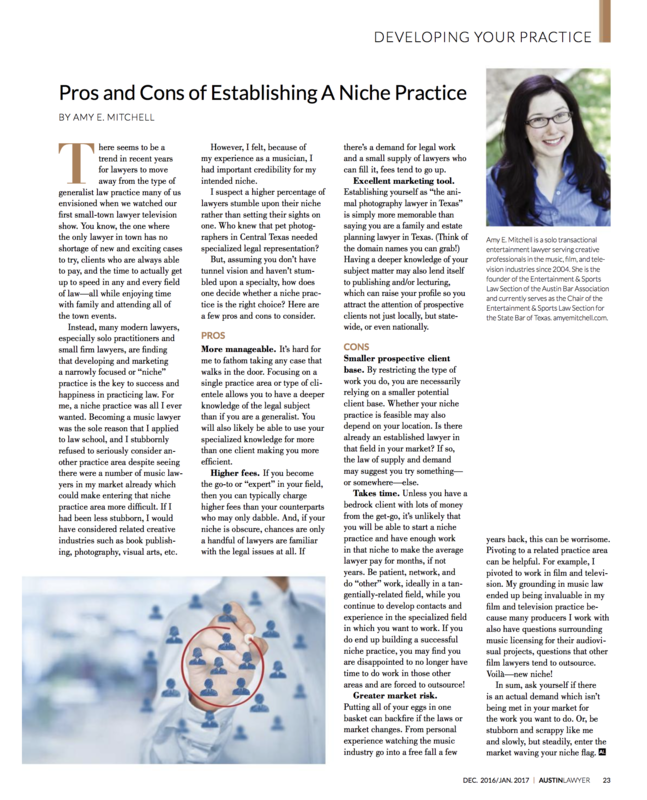 “Pros and Cons of Establishing a Niche Practice” by Amy E. Mitchell. Published in Austin Lawyer magazine, December 2016. “Music for TV and Film: Is New or Existing Music Right for Your Client?” by Amy E. Mitchell and Steven Winogradsky. Published in Chapter 8 of the Entertainment Law Institute Manual, November 6, 2015. “General Considerations in Evaluating Copyright Matters for Entertainment Clients” by Deena B. Kalai and Amy E. Mitchell. Published in Chapter 1 of the Entertainment Law Institute Manual, September 26, 2013. “Unhand That Orphan: Evolving Orphan Works Solutions Require New Analysis” by Christian L. Castle and Amy E. Mitchell. Published in the Entertainment & Sports Lawyer, Volume 27, Spring 2009, a quarterly publication of the Forum on the Entertainment and Sports Industries for the American Bar Association. “What’s Wrong With ISP Licensing?” by Christian L. Castle and Amy E. Mitchell. Published in the Entertainment & Sports Lawyer, Volume 26, Fall 2008, a quarterly publication of the Forum on the Entertainment and Sports Industries for the American Bar Association. “Orphan Works Legislation: Mind the Step” by Chris Castle and Amy E. Mitchell. Published in the Texas Bar Journal, Vol. 71, No. 9, October 2008.